...otherwise known as the "Trees of Indecision." As soon as I saw these two-tone trees from A Dozen Eggs, I knew that tree cookies were in my future. But, since I seem to have an obsession with dots....whether it be on cakes or apples or presents....I added some dots. The indecision came in with the sanding sugar and the wood grain trunk. To sugar or not to sugar. To wood grain or not to wood grain. Those were the questions. Now, *someone* in my house does not care for sanding sugar. (Not the way it looks, but the way it tastes.) Had I known this before marrying him, we would have been in for some MAJOR pre-marital counseling. 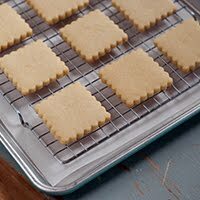 I, on the other hand, love that bit of crunch on a soft sugar cookie. So, I went for half and half. 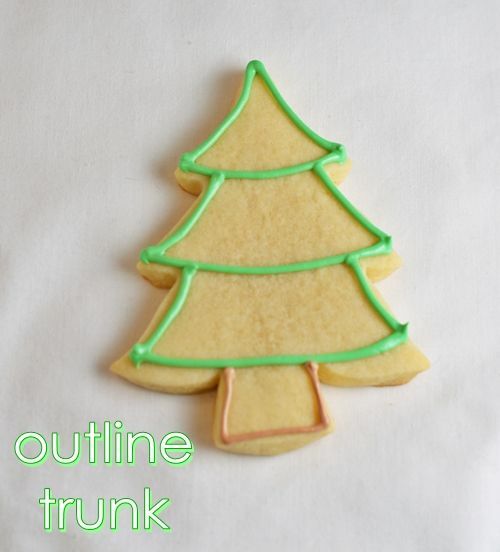 With a #3 tip, outline the tree on green, piping 3 sections of the tree. With a #2 tip, outline the trunk in brown. Thin the green, light green and brown icings with water, a bit at a time, until it is the consistency of thick syrup. Cover with a damp dish towel and let sit several minutes. Stir gently with a rubber spatula and transfer icings to squeeze bottles. 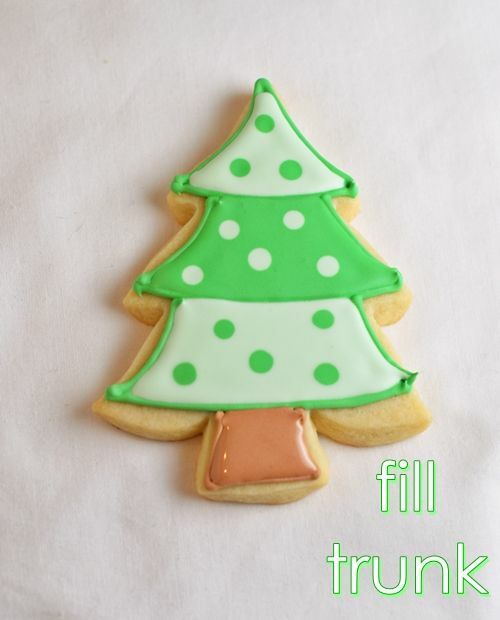 Working 6-8 cookies at a time, fill in the trees in the 3 colors of green. Use a toothpick to spread to edges and pop large air bubbles. 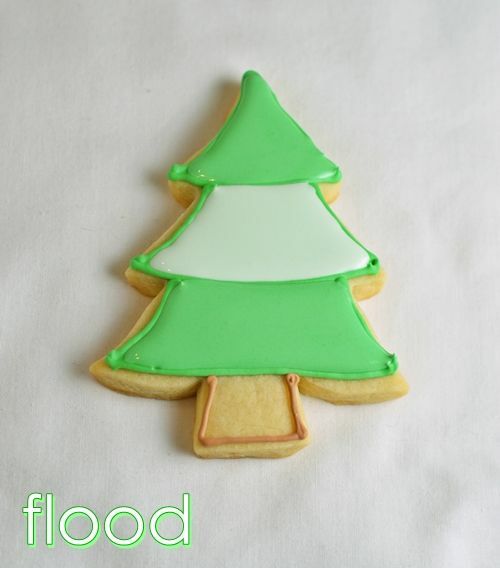 Come back over the filled trees while the icing is still wet and drop on dots of thinned icing. Fill in the trunks in brown. Use a toothpick to spread to edges and pop large air bubbles. The next day, set up a sanding sugar station. Mix equal parts meringue powder with water. 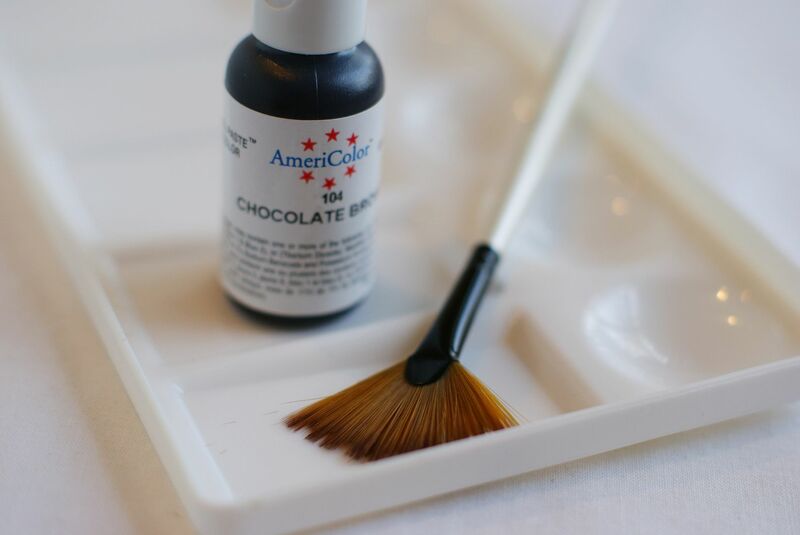 With a small paintbrush, brush the mixture on the area to be sanded. 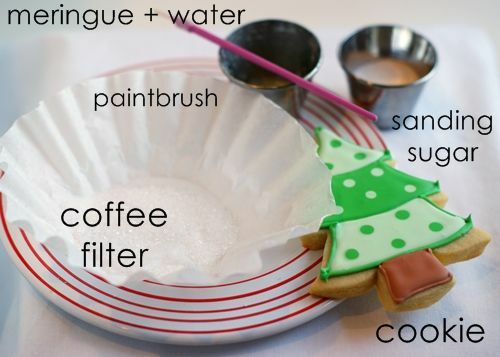 Sprinkle on the sanding sugar and shake excess over a coffee filter. The filter can be used as a funnel to go back into the bottle. For the wood grain, I used a cookie painted technique from Renee of Kudos Kitchen. 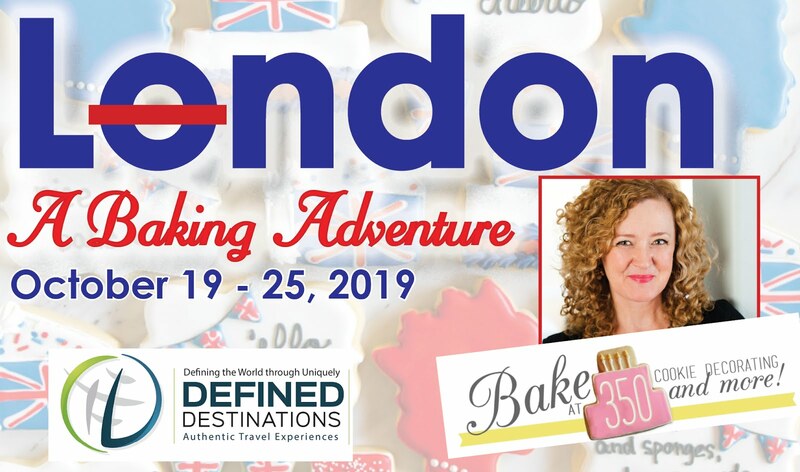 She is a fabulous artist, check out her painted tiles, and she shared a video of how to add wood grain on cookies at University of Cookie. 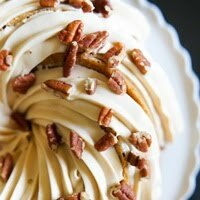 Tell me....are you a sanding sugar lover like me, or do you side with Mr. E on this one? 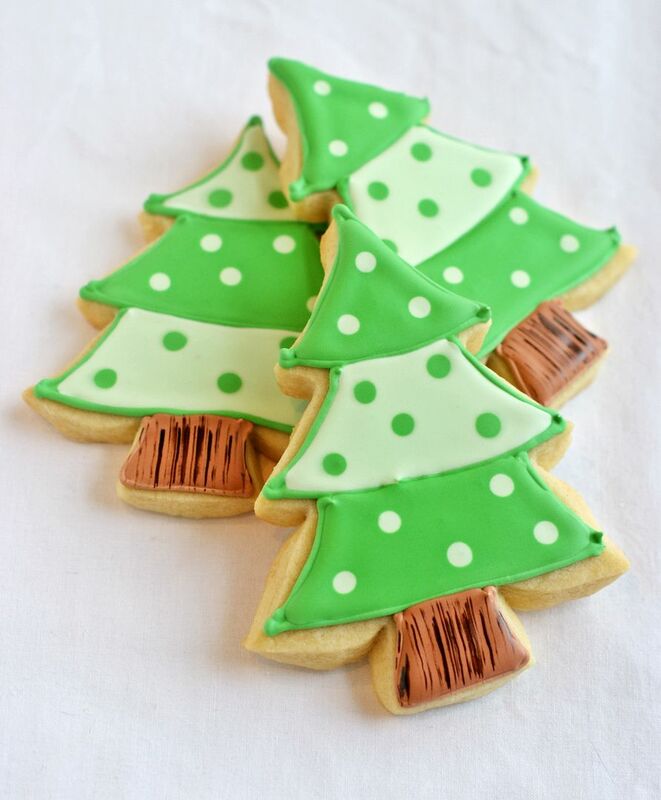 Cutest Christmas tree cookies EVER♥ I think the sanding sugar makes it look adorable!! your cookies are always so pretty! i really wish i had the patience to try that. LOVELY! I'll be making a funky forest next week when I get home for CHristmas. I have followed your tutorials and made a giant snowman cookie and about 40 snowballs to go around him. Would love to share pics, but ??? Preciosas! Tan sencillas y tan bonitas. Love. Bridget! I need help! I have tried to do the luster dust or sanding sugar trick like you and all I get is my royal icing looking like doodoo because getting it wet causes it to sorta disintegrate? Any recommendations???? 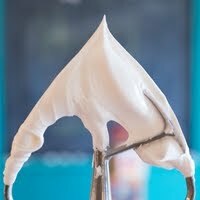 Try letting the icing dry more and don't put too much liquid on. Lovely. I am so inspired! I like both but I think I'd LOVE disco dust or luster dust!! Great job and again - thanks so much for all the detailed explanations! You make it MUCH less intimidating to try! I can't pick a side; they're both super cute! Loving the wood grain b.t.w.! Love these!! so simple, but totally delightfully gorgeous!! You are so smart girl! The 3 grandkids & I made your sugar cookies last night. Had a blast & they turned out very well. The sanding sugar looks great but not sure if I prefer it on when eating. 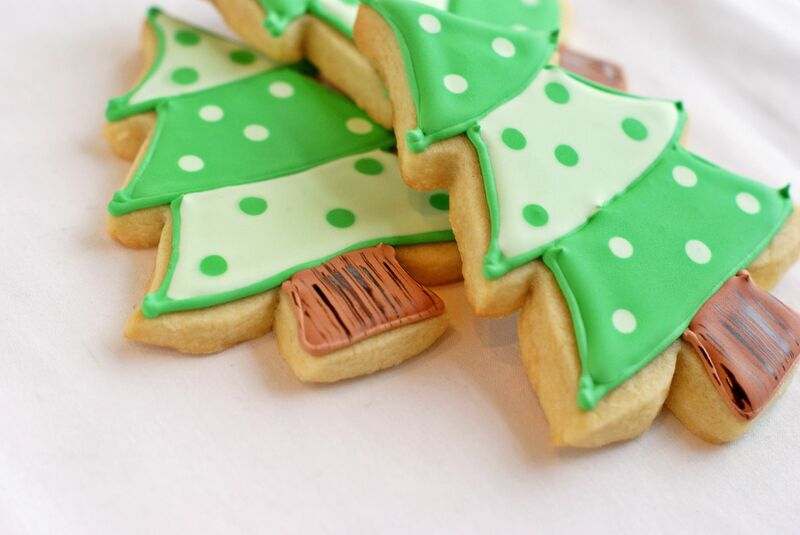 The tree cookies look great as always. You are so talented! Those are way too perfect. I love the look of it without the sanding sugar myself! I can see the bright green so much better! They are the cutest little trees! I love the polka dots! I wouldn't be able to decide on sanding sugar or without they are both so pretty. A mix of the two would look nice. The trees are so CUTE!! Looking at the photos, I would prefer without the sanding sugar, only because the colors are brighter. Thanks for the detailed tutorial! Oh, these are cute! I like a little crunch too. I love the tree bark at the bottom that's so adorable. 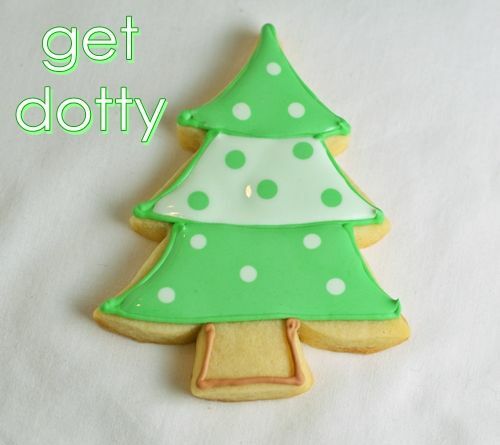 Your step by step instructions make me want to attempt cookie decorating! I don't think it's coincidence that I have 2 dozen naked Christmas tree cookies on my dining room table. I was trying to figure out how to make them special, and two tone may be the way to go! Thanks for a great idea! These are darling! I'm gonna have to try them! I love the tree stumps! Also I will have to say I do not like sprinkles because of the crunch, so I have issues too. I'd have to say trunk with the woodgrain and tree without the sugar, just for the look I'm gonna side with Mr E. The dots are sooo cute. I share you love of dots! Love the sanding sugar effect! Of course I love all of your cookies. 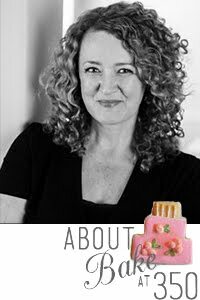 I made your recipe this week and they are FAB! Loved them! Like the idea of the two tone decorating and the tree trunks with the wood-grain look are great. As for the dots...now that's a tree with a lot of pizazz! Thanks for the great tutorials! I made my VERY FIRST decorated cookies this weekend! Super yummy and super cute! i can't wait to try more next weekend. Thanks again! Hmmm...I think I'm siding with Mr. E on this one. =) But I'm sure they're both delicious! Very cute! I love your polka dots too:) Good to see that you reached a good compromise with the trees! I absolutely love the brush strokes on the tree trunk. It makes it look even more believeable!! You're probably not surprised that I love these cookies, Bridget! I posted about them on my polka dotted blog today. I love these! That green is my favorite color! 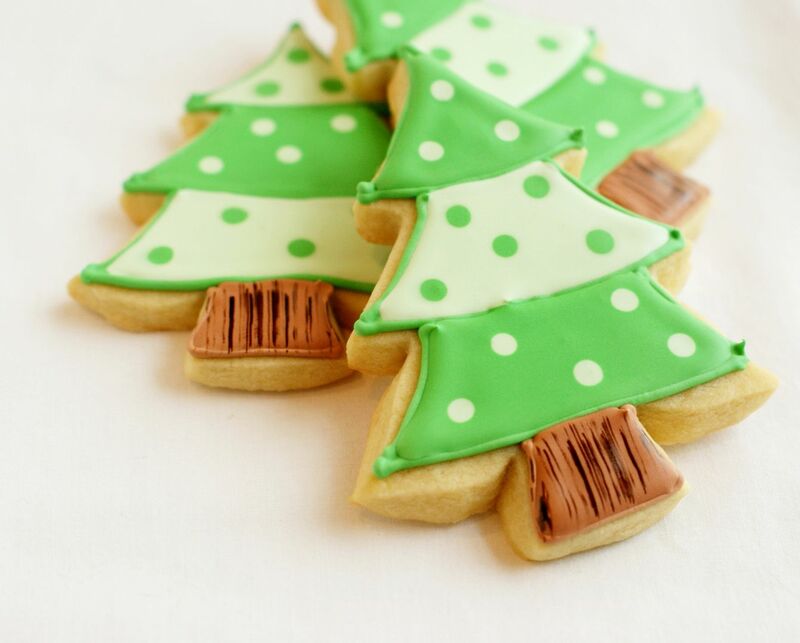 your Christmas Tree Cookies are just adorable! Will try to copy your idea when I will do more baking later this week. I like the look of the sandy sugar, but am not the biggest fan of the texture. 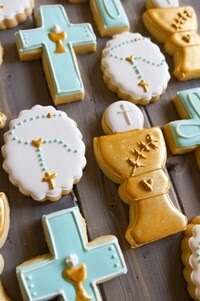 I will eat both if it means I can get my sugar cookie on, but would take unsugared before the sugared. Sorry, but I wanted to say I love your blog. These are so cool. 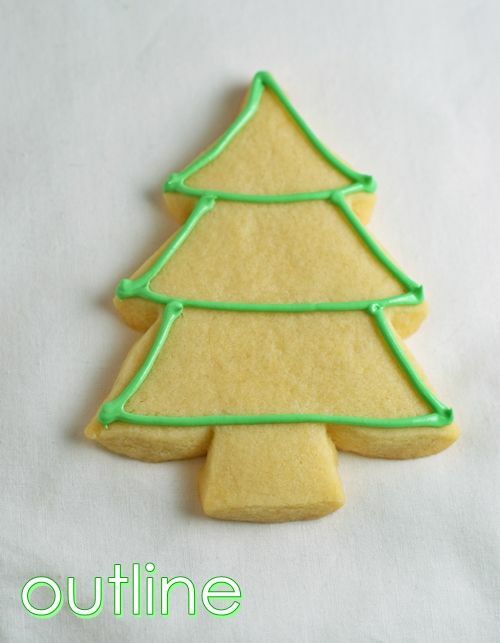 I came on to your blog tonight to see what cool ideas you had for Christmas cookies and yay the trees are awesome! I might have to try tomorrow. 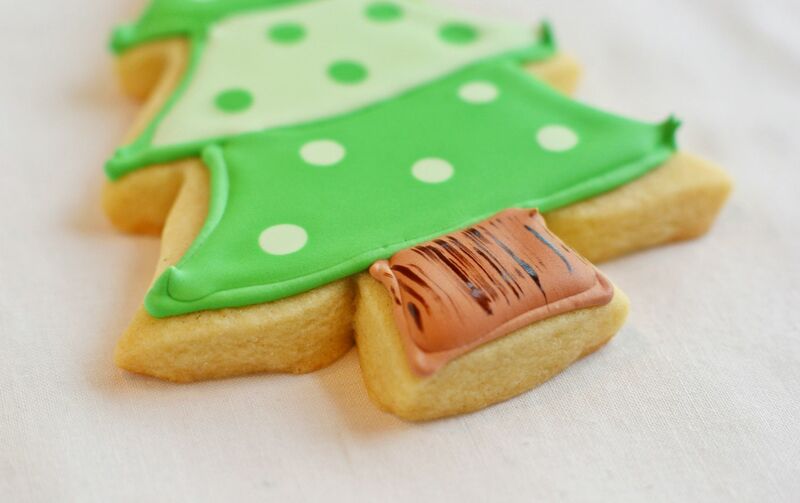 Wow, your cookies are seriously beautiful! So impressed with all you do with them. A work of art. Came over to get your sugar cookie recipe to try. I love the tree. It looks great. 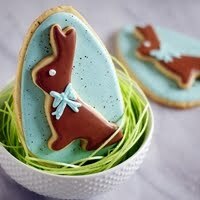 Super lovely cookies. Look so great! I have to side with Mr. E! OH I LOVE LOVE LOVE THESE!!!!! sorry but I have to side with Mr. E. but I do like the look of the sugar. I would have to do what you did and make some of each. I *love* these! 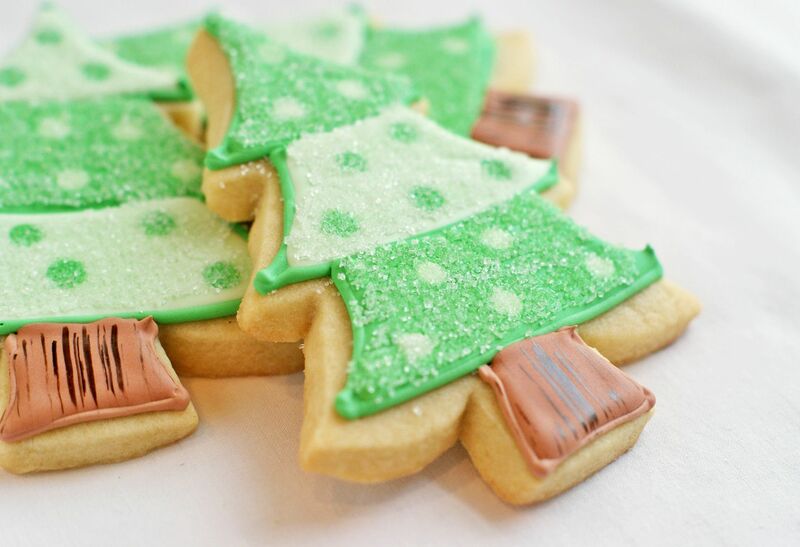 I never know what to do with my Christmas tree cookies because plain green just seems boring, but when I try ornaments they look silly. This is perfect! Love the trees. Don't like cookies with crunchie toppings. No sanding sugar or sprinkles for me, thanks. Your trees turned out wonderful. You are so talented. 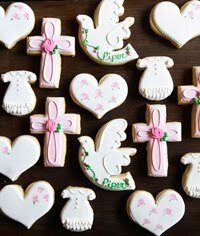 I wish I had this kind of talent so I could make gorgeous cookies. Darling! Oh, I love the painted trunk touch. I love your Christmas trees!! Where did you get the cutter from? these are adorable! You are quite talented, Bridget!! 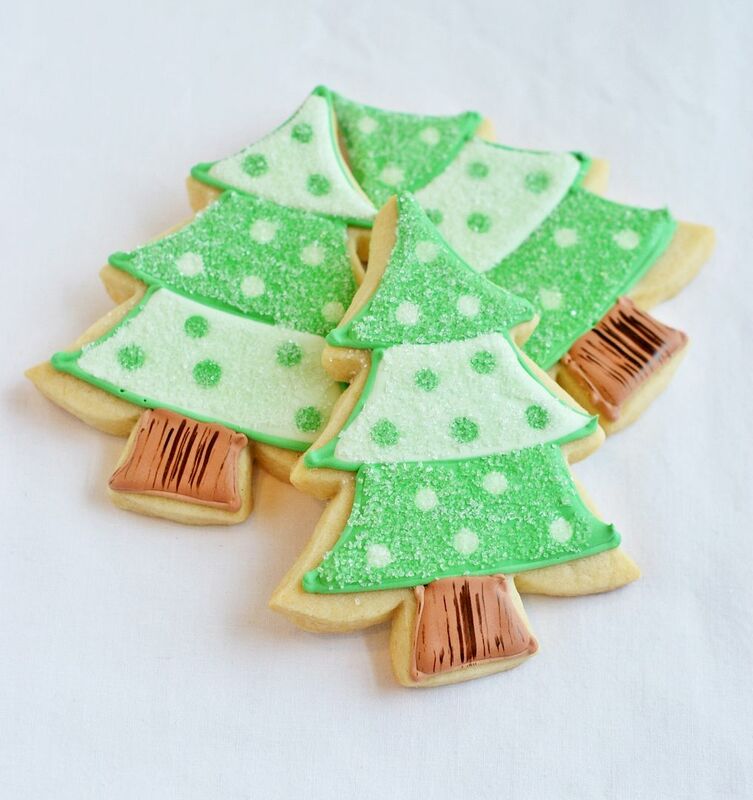 My sister and I made our own Christmas tree forest cookies this year, but I can't believe we didn't think to make any of them sparkly! These are adorable! Just as great as all your others! 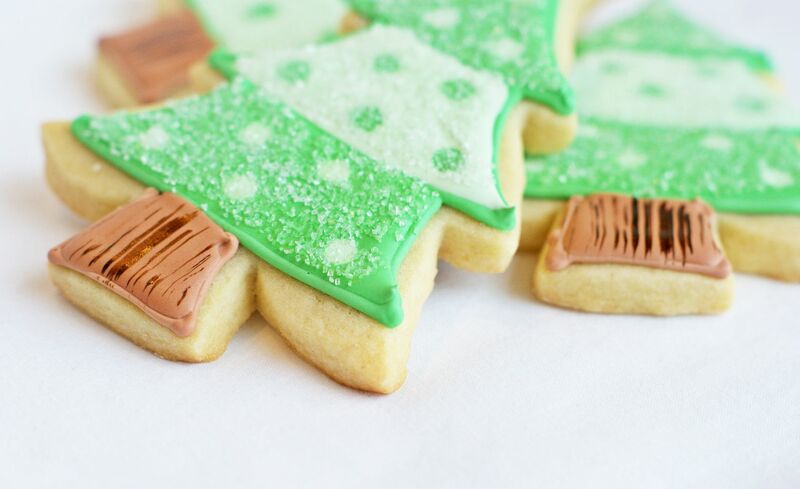 I love your tree cookie cutter with the "curved up branches" Where can we find one? Thanks for a great recipe! love it!